There was never a better time to trust weather apps than it is today. Unlike older times, weather forecast has become more than mere predictions. It’s been giving information that can save you a lot of time and effort but now the information is turning out to be true. These apps are getting really specific about weather essentials. As a seasoned traveller I am suggesting to rely on these applications to save all some efforts in order to make your travel a better experience. Our homeland has been a welcoming destination to storms and hurricanes. We have faced a lot of property damage and loss of human life due to these severe conditions. The app gives you radar images which change at real time with detailed information. This app notifies you each time a warning is issued about any destructive weather condition. You can also connect the app to your apple watch to be double sure about any notification. Though the app is free, it takes $1.99 from android users to remove unnecessary ads. iOS users have to buy the app at $3.99. If you are looking for a simple and straightforward app instead of an interactive and creative one, this is your answer. This app gives you the most specific results which are to the point without the disturbance from ads. You can also choose the sources to derive your data. Now, that’s what I call a powerful application. Users can set locations according to their choice (like any other application) and can also get detailed hourly data (that’s a plus). You will also get graphs with every timeline to ease the process of understanding the information. Android users can buy the app at $0.99 and iOS users can look out for any other app. If you are the supporter of free apps like me, you should probably go for Yahoo! Weather. It has the most attractive user interface that gives you relevant information without any trouble. I have been using this application and it has proven its worth each time I’ve used it. It gives you thorough information about the weather of next 5 days with satellite imagery and heat maps. Yahoo has worked well to maintain a balanced look for both operating systems. This app saves you from getting confused with extra information. It’s clean and crisp information makes it a great everyday app. Don’t look anywhere else in case you are the unique person among the average humans. Wild Weather informs you about the temperature with illustrations which are hand-drawn. 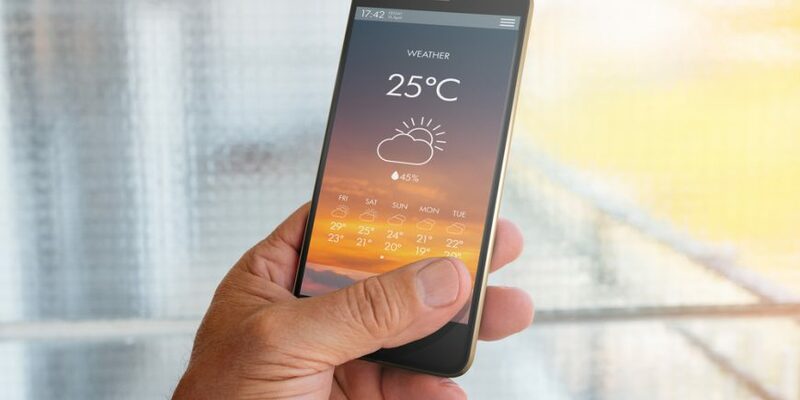 It’s better for individuals who want to know about the weather at a single glance. Ex- You see bright sky, still trees and deer gazing at the horizon. It’s sure a sunny day. You will also get more details if you swipe up. It will surely add to your already outstanding personality. There are plenty applications which promise to be the best. It’s basically a matter of time till you find the perfect application. For now, you can check out my suggestions.